UNITED NATIONS, October 14, updated -- Three days ago, Secretary General Ban Ki-moon's spokesman Martin Nesirky was asked if the UN could confirm, and comment on, the Sudanese government's interrogation and intimidation of internally displaced people who spoke with members the UN Security Council during their trip to Darfur. Nesirky said, “let's find out” -- but three days later, nothing. The same for another question asked by Inner City Press at the October 12 noon briefing, about the Sudanese government's beating and arrest of pro secession demonstrators. Nesirky said “I’ll see what we can get you on that” -- but two days later, nothing. At 8 am on October 14, along with reiterating these and other outstanding questions, Inner City Press posed to Nesirky and his deputy Farhan Haq a few simple, factual questions, asking that they be responded to by the conclusion of Nesirky's October 14 noon briefing. Nesirky was also asked this question on October 13. There were also three totally unresponsed to questions on a topic that Nesirky and Haq - and their boss? -- show most resistance to answering. These remain unanswered.Watch this site. Footnote: On October 8 in its “Week End,” Nesirky's office said that there will be no October 15 noon briefing, just as another Friday noon briefing was canceled despite other spokesperson's office staffers being there. Nesirky has said that such cancelations are okay because questions can be asked by email. But then he and his office neglect to answer simple factual questions submitted by email four and more hours before noon. So which is it? While the appointment of a Permanent Representative is an internal matter for Zimbabwe, which is to be decided upon in accordance with the provisions of its own domestic law, the Secretary-General believes that the Prime Minister’s letter highlights a source of concern regarding the political transition in Zimbabwe. In that regard, the Secretary-General urges all Zimbabwean parties to respect the commitments they made in the Global Political Agreement of 15 September 2008 and ensure that the Agreement is implemented in its entirety in the interest of stability in Zimbabwe and the welfare of its people. The Secretary-General encourages the guarantors of the Agreement, the Southern African Development Community and the African Union, to continue to accompany the implementation process and help build trust between the Zimbabwean parties. The United Nations has expressed its readiness to support that process, if requested to do so. The appointment of a Permanent Representative is an internal matter for a Member State, which is to be decided upon in accordance with the provisions of its own domestic law. Ambassador Chipaziwa was properly accredited as Permanent Representative of the Republic of Zimbabwe to United Nations Headquarters in New York on 28 June 2010. We will be bound by the letter of his accreditation until advised otherwise by the Ministry of Foreign Affairs. So it took more than eight hours to say... “we aren't going to do anything”? And what about the numerous other unresponded to, not even acknowledged questions? Watch this site. UNITED NATIONS, October 14 -- Upon arriving in South Sudan a week ago, the UN Security Council was met by two separate demonstrations. The following day the Sudanese media on the UN flight from Juba to Darfur were thrown off the plane. This was first reported by Inner City Press, then by Sudanese publications and others. From the US early on October 13, Inner City Press directed three questions to the UNMIS spokesman in Khartoum. Twenty four hours later, responses were provided. But each was a model of evasion, explicitly not providing the basis information requested and in one case simply referring the question back to spokesman for Secretary General Ban Ki-moon in New York, Martin Nesirky, to whom it has been re-directed four hours before his October 13 noon briefing. Why not say what the “formal response” was? Security Council members, including a Permanent Five member whom Inner City Press spoke with about it, saw and then read out the ejection of the Sudanese media. What is UNMIS' response? The Council meets on Thursday morning about its Sudan trip - will it exclude this aspect? While Inner City Press was told, while at Juba airport, that much (but not all) of the protest of the UN was directed UNDP, the UN Development Program, and not only at UNMIS, doesn't UNMIS have some role to speak for the UN system, at least in South Sudan? For example, the UN system's Humanitarian Coordinator and Resident Representative Georg Charpentier is, he seemed to say in El Fasher, an employee of UNDP. But still he purports to speak for the wider UN system. (Inner City Press has posed these and other questions to UNDP). Cannot a formal spokesman like Eissa do the same? UNMIS' stated mandate includes “promoting understanding of the peace process and the role of UNMIS by means of an effective public information campaign, targeted at all sectors of society... promoting the rule of law, including an independent judiciary, and the protection of human rights of all people of Sudan” -- including, presumably, those Sudanese protesting their exclusion from jobs of the UN system, including UNDP. 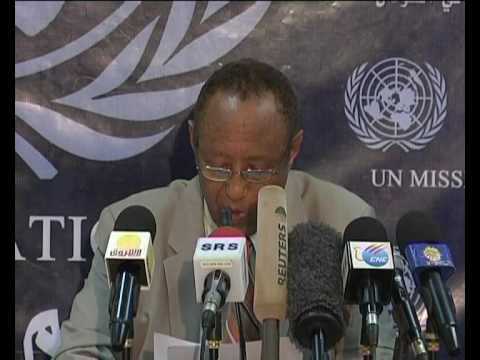 While the Council and media were in Sudan, UNMIS one-year chief Haile Menkerios did not speak with the press, despite requests made to the UN. Media based in Sudan say Menkerios rarely provides responses to reporters. What about “promoting understanding of the peace process and the role of UNMIS by means of an effective public information campaign" ? The work of this panel in South Sudan and Abyei until October 15 is breathlessly reported on UNMIS' website, so Eissa's response seems too legalistic. Even though answers promised by Secretary General Ban Ki-moon's Spokesperson in New York Martin Nesirky back on October 11 have still not been provided, Inner City Press is re-directing this and other questions to Nesirky. Watch this site. UNITED NATIONS, October 11 -- The UN says that the situation in Sudan is of much import to it. But then the UN refuses to answer questions, and refuses to let the Press cover what the UN is doing about Sudan. The October 11 schedule of Secretary General Ban Ki-moon included a 4:30 meeting with “Sudanese Church Leaders.” Every other appointment continued the name of the counter-party. Usually such meetings begin with a photo opportunity. This one was no different -- except only UN Photo and not the Press was allowed to photograph the meeting. Inner City Press asked the UN Media Accreditation and Liaison Unit if it could photograph beginning of the meeting. It was confirmed that UN Photo was going; the staged handshake would take place. But “Farhan” -- on information and belief, acting Deputy Spokesman Farhan Haq -- said no, Inner City Press could not attend the already scheduled photo op. No reason was given. 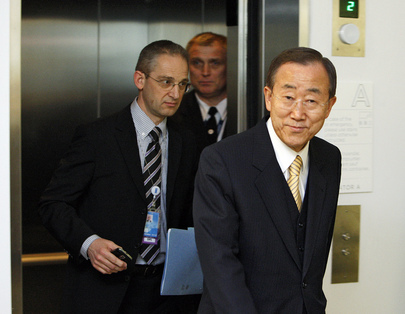 Nevertheless, Inner City Press went to the North Lawn building, two stories below Ban Ki-moon's office. Francis Deng, the Sudanese advisor to the Secretary General on Genocide, went up, stopping to confirm to Inner City Press that he was attending the meeting. Then a UN Photo staffer went up. But Inner City Press was not allowed. 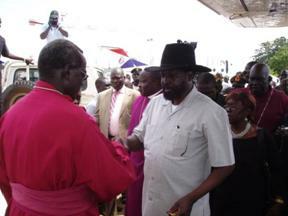 After the meeting, Inner City Press waited and spoke with the Episcopal Archbishop of Sudan, Daniel Deng Bul. He told Inner City Press that everything must be done to ensure an on time and peace referendum, that was the only way to protect the churches in North Sudan. He told Inner City Press: "they have to push to have a peaceful Sudan, the referendum [in time] - once done, you've brought a peaceful country." But few whom Inner City Press spoke while covering the Security Council's four day trip to Sudan were hopeful for an on-time much less peaceful referendum. And the demonstrators in Khartoum on October 9 were saying that only unity could bring peace. Inner City Press asked about resource sharing, Abyei and oil. The Archbishop said the CPA contains the mechanism: 50 / 50. But even now the mechanishm is hardly working. Archbishop Bull and his delegation -- Inner City Press also spoke with Caritas' Permanent Delegate to the UN -- have other meetings set up. Let's hope those are more transparent, and that those met with can bring more to the table. Watch this site. Footnote: also at the UN on Monday, Inner City Press directed a question about Sudan's external debt to Eckhard Deutscher, Chair of the Development Assistance Committee of the Organization for Economic Co-operation and Development: would OECD countries be willing to forgive some of Sudan's $37 billion in debt, as a way to sweeten the pot, or make the loss of oil revenue more palatable? Mr. Deutsche responded with platitudes, about the IMF's good programs. But a Permanent Five ambassador on the Sudan trip told Inner City Press that Sudan (and South Sudan) are not eligible for the HIPC program. So what is being done?